Fujitsu is a large highly regarded Japanese company in the electronics industry and an established world wide brand. 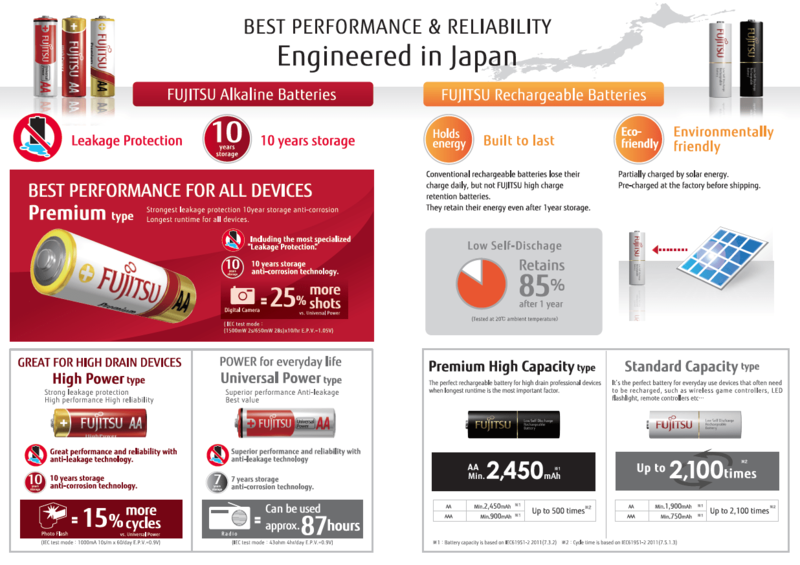 As the owner of FDK, one of the world’s largest portable battery manufacturers, the Fujitsu brand is used for the extensive consumer range of battery products. Anti-leakage protection for up to 10 years storage guaranteed* – the highest anti-leakage reliability in the world thanks to the latest anti-leakage and anti-corrosion technology. Holds 95% of its capacity even after 10 years storage so they are always ready to use, making Fujitsu Premium Power alkaline the best choice for emergency supplies and other long term storage situations. Improved capacity means maximum runtime for all devices from low drain to high drain.